This is going to be kind of lengthy. First, you can hear me clapping, yesterday I found out I had won 1st place at Crazy 4 Challenges on my Key To Your Heart card and at The Pink Elephant Challenge I was picked as a Top 15 winner, there is alot of talent entering these challenges so to be picked as any kind of a winner is a real honor. Supplies: Pretty in Pink Card Blank 5" X 6 1/2", Papers: Stampin Up, glossy card stock, Stamp: CTMH-D1309 Heartthrob, Ink: Ranger Archival Ink-Jet Black, Stampin Up-Soft Suede, Pink Pirouette, Ranger Alcohol Inks, Martha Stewart-Embossed Trefoil Heart border punch, Stampin Up-Sizzix Flourish texture plate, ribbon-Offray, silver cord, Plaid-metal heart charm, Michael Richard's-crystal stickers. Gorgeous card as always and I love how the inked background matches the ribbon! Your card is just wonderful. I haven't been able to post for a while, but I love all your cards. Why wouldn't you be picked?? Beautiful card! I love the colors! Thanks for playing @ PPA! Congrats on your winning and WOW on this amazing creation!!! Thanks for joining us at Raise The Bar & Saturday Spotlight! Can't wait to see what you create for us next challenge! Congrats on your picks - and after seeing this card I know why! Very pretty - thanks for playing at PPA! WOW!! I do love that heart!! Very unusual and unique!! Thanks for playing along with the Divas!! Love to see what you come up with!! Ooh, very unusual! Love that background technique you came up with and agree that heart stamp is fabulous. Very funky and so fun! Thanks for playing with the Divas! Very nice!!! I love it! Thanks for playing along with the BarTenders at Raise the Bar!!! 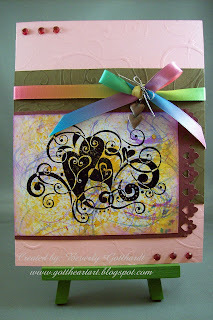 Beverly what a gorgeous heart stamp! I love what you've made with this, it is just beautiful with the color combo. :D You've done a wonderful job on this card - thank you for joining us at Raise The Bar this week! Great card, Beverly! I love this stamp, can see why it's a favorite. Great swirls and flourishes! Congrats on all those wonderful recognition awards!! So glad that you got to show some love to your older supplies! Great to see you joining in the fun with Our Creative Corner this week. So fun!! that just reminded me of a project I did in summer camp ages ago!! With the ink and straw! Fabulous! Thanks for sharing with us at Saturday Spotlight! What a beautiful creation and a great take on the Around the House Challenge at Saturday Spotlight!! Thanks for joining us this week! Love your technique!! How creative!! What a gorgeous result! Thanks for sharing with TPE this week!! Very pretty card!! Thank you so much for sharing this with us at The Pink Elephant! !